Massive disruption is expected in the storage space. The disruption goes beyond just technology, impacting people and process. 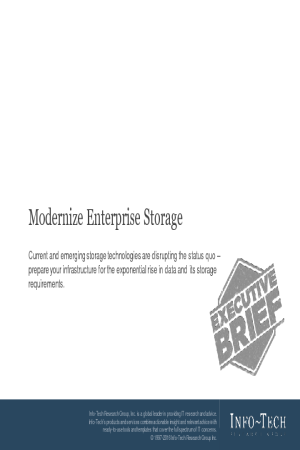 Software-defined storage is changing how data is handled, stored and consumed. Meanwhile, the continued fall of flash storage costs is making it a viable replacement for traditional spinning disk. For many use cases, flash storage already produces a lower TCO than disk. Data management complexity is growing just as fast as data. Data continues to grow at an exponential rate, but infrastructure budgets remain stagnant. More disk cannot be the solution to more data.